I have been ridiculously well occupied in my blog absence – not always with sewing but mainly so. I am staggering out of the end of a load of client work, including three weddings which make me wonder how Mrs Mole , who specialises in wedding and prom dresses, ever stays sane! I was a bit glum after my recent batch of sewing for me. Nothing really seemed to ‘hit the spot’ so I decided to go back to the wardrobe and analyse what I actually wear rather than what I would like my wardrobe to be. My wardrobe staples are jeans (sorted now thank to the Kenneth D King course) and t-shirts/tops. I tend to wear those in preference to shirts although there is no real reason why. 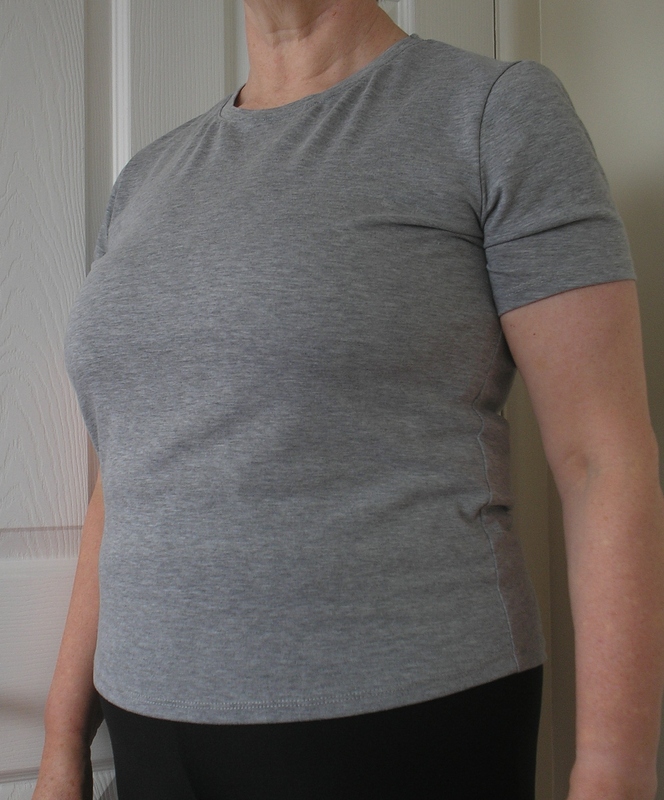 Particularly strange since I can’t generally buy t-shirts which fit both my bust and waist/stomach area – they tend to stick out away from my front below the bust. I still wanted to do more with the wonderful Japanese pattern cutting books but, again, I had been struggling for success with them. So…. I started by drawing out a new T-shirt block using the Kristina Shin book I used for my (successful) leggings. I knew that by drawing out a t-shirt block which fitted well I could use that to check to Japanese pattern sizing to be more sure of a good result. The first attempt was very short. Seriously, I went back and checked my measurements and pattern cutting against the instructions and decided it was clearly personal preference. If you are using this book it would be worth checking the finished pattern length against an existing favourite garment. The fabric used was a cheap single knit viscose mix from Birmingham Rag market which was surprisingly nice for the price. Closer examination showed a run right along the centre fold that didn’t concern me as I managed to cut around the problem. The second attempt is shown left, still a little shorter than ideal and whilst not a perfect fit much closer than any I can buy so I am calling this a win and will tweak the block before making again. The neck binding is a little tight (I cut a length 80% of the neck measurement for the binding but could possibly have forgotten seam allowances.What can I say? ), and the bust could possibly benefit from a small FBA but it is very comfortable to wear. Since making this I have worn it on a number of occasions and it has washed and worn well. Happy with the stripe matching! With this small success in my system I went ahead and traced out the pattern from Drape Drape 2 for the Number 2 dress. I have long wanted to try this dress but had minor doubts that it was a sensible idea for a lady of my bulk and vintage. Despite that I went ahead and traced the largest size in the book and used my new t-shirt pattern to ensure I would actually fit into it. On the same trip to Birmingham I bought a length of single knit jersey from Barrys. It feels very cool and has a cottony/lineny feel but I can’t remember the fibre content and cant be bothered to do a burn test on the remains. It has no lycra content so is reliant on its ‘mechanical’ return, which is not as good as a jersey with lycra. 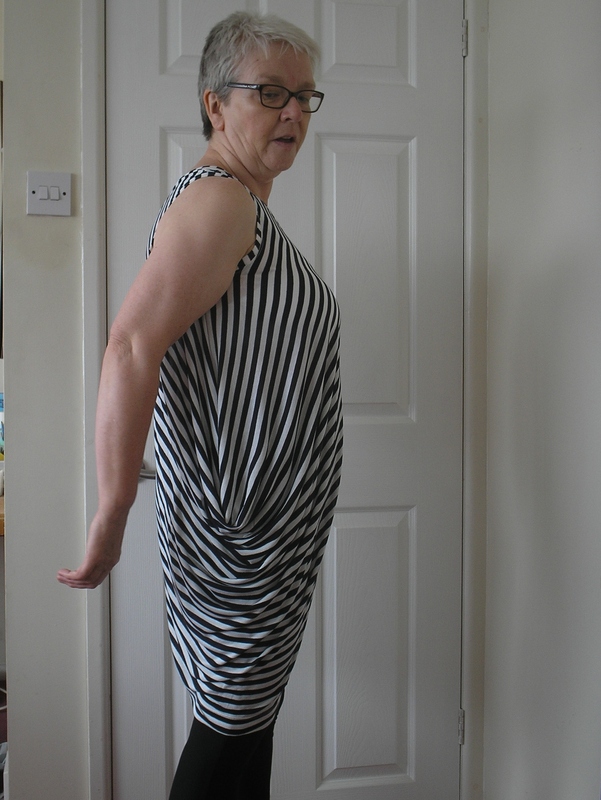 The pattern fitted easily into the 1.5m I had bought and I made the whole garment using just the overlocker/serger and my coverstitcher so it took very little time. I was particularly happy with the chevron stripe matching on the left side as I hadn’t relied on the overlocker to do as good as that before. 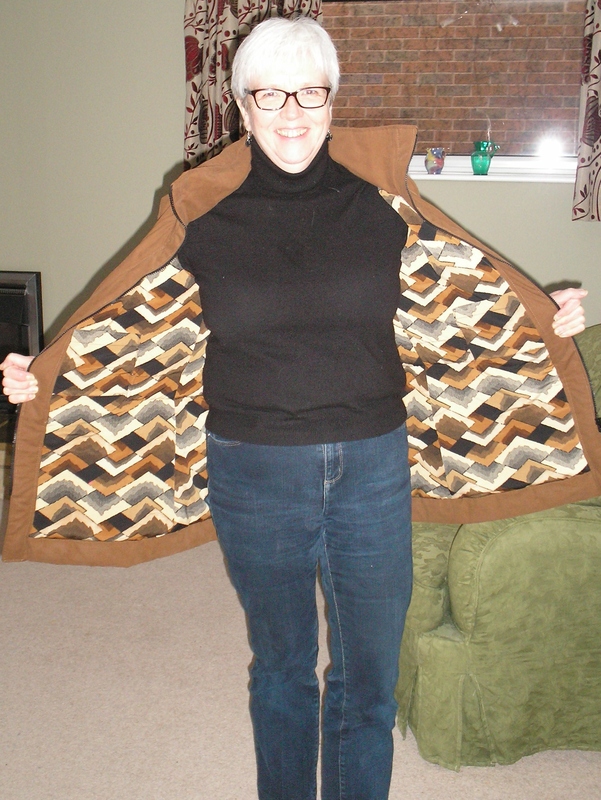 I am pretty happy with the result, though it doesn’t look anywhere like as good on me as it does on Sew Busy Lizzie ! I knew I had admired her dresses(yes, she has multiples of this dress) a good while ago but was a little surprised to see it was the beginning of 2014, shortly after receiving this book from my dear sister as a Christmas gift. I wore this to a family lunch on Saturday in Northumberland and was pretty happy with the result. It was unusually warm for the north east of England and perfect conditions for a sleeveless dress, although I did wear it with leggings as my legs are still blindingly white! Over the course of the day I was aware of the hem getting wider, and less snug on my thighs which helps to keep the ‘swag’ in shape. I will almost certainly make another one of these but will ensure I have a fabric with a good lycra content so it holds its shape better. Despite that I feel happy with the result though I think I will almost always wear this with leggings. The trip ‘up north’ was also to take in a visit to The Bowes Museums ‘Style is Eternal’ Yves Saint Laurent exhibition which was wonderful, and as soon as I get the photographs sorted I will do another post. Just like buses – no posts for an age then two in quick succession. Back soon. So today the picture feature seems to be working so here we go…. As you can see the finished garment looks weird (and is a monster to fold) but that is what gives you the wonderful drape. The instructions were to bind the neckline but I went with the easy option of a 4cm strip, folded in half, and sewn at a slight tension round the opening before anchoring with another row of stitching. Easy, fast, fine. 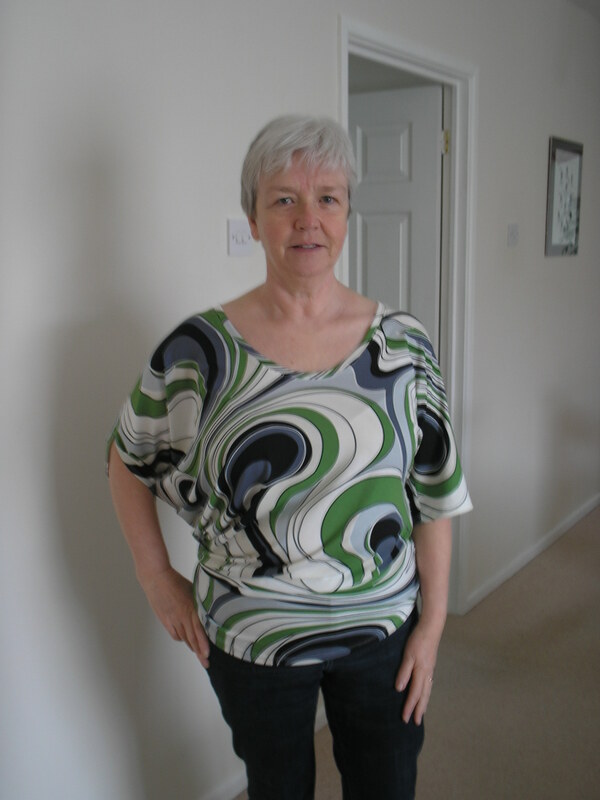 Front view – check out that neckline! The front view of the top doesn’t quite give the impression of how low this neckline goes as it is leaning to the back. Next version will have the neck raised by the recommended 10cm (Thanks Melissa!). The back view shows the amount of cloth in this garment – it is huge! 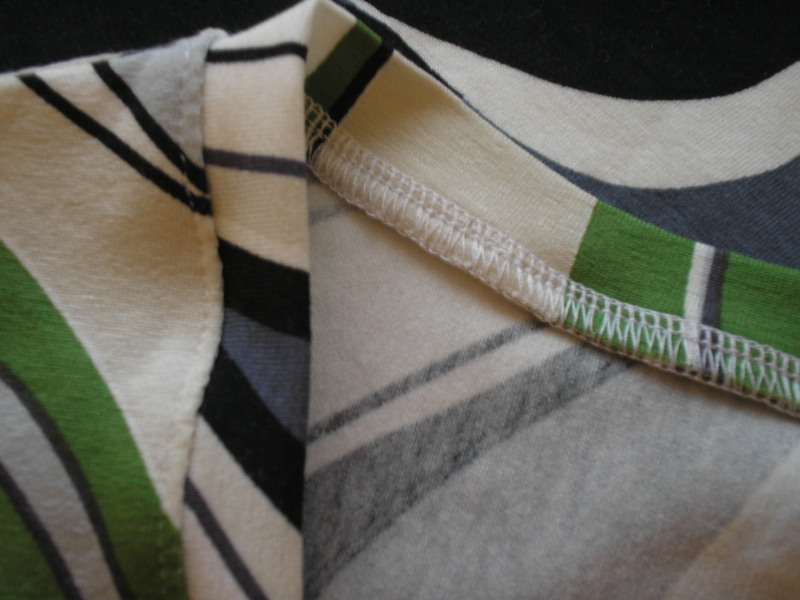 The left sleeve is a pretty normal kimono type sleeve but the right is just a hole in the seam at the top of the fold. I like the idea but I think that my pattern needs some attention to fitting. I also need to find a photographer who will mention that the back is folded up before they take the photos and clear off back to their newspaper! 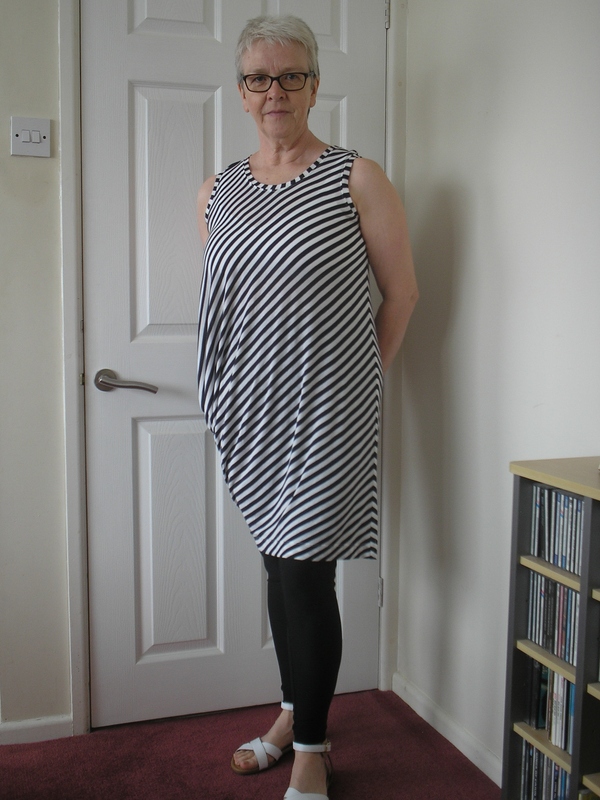 I will probably wear this as I love the fabric – but I really need to try again in a different size, with a raised neckline, to see if that is better. A reasonable first draft. I have finished the one piece draped t-shirt from Drape Drape 2 detailed in my last post – and I like it. I just don’t love it. I made the pattern in the size indicated by my body measurements but I think it might have been better a little smaller. I know that Melissa commented in this post that she made this up in the largest pattern provided (despite her also thinking she needed a larger size) and it was fine. At the moment I can’t get the pictures to work on this post but I will update as soon as I can. The one major comment I would make is that the neckline on this is low. Like really low. Just in case you were about to cut out. Check it. Twice. 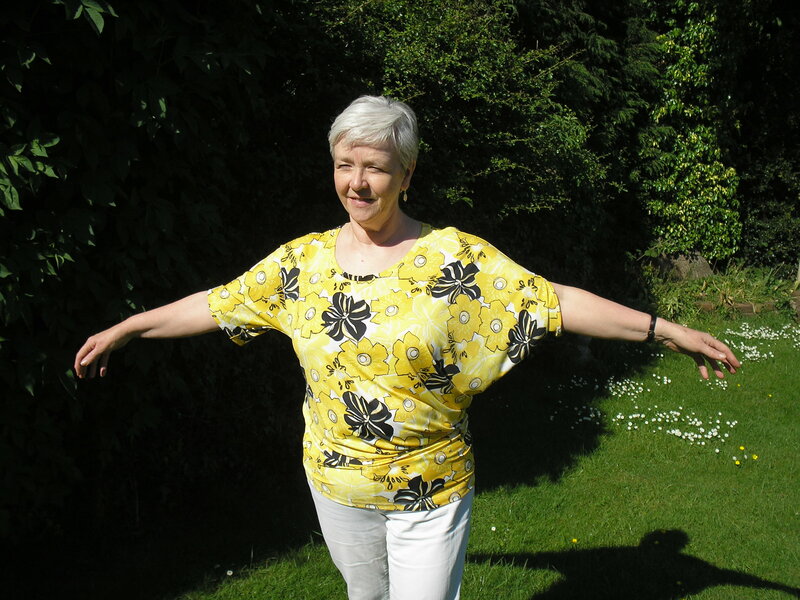 I have enjoyed my time making the patterns for the two Japanese tops I am making as my February Garment(s) of the Month – and they really weren’t difficult. The Drape Drape 2 book comes with the patterns included – but not in my size. In order to be able to have these enlarged at my local copy shop I did a ‘Burda’ on them and traced all three pieces on one sheet for enlargement. They were easy to trace off into one big pattern piece after that, and it is now cut out. 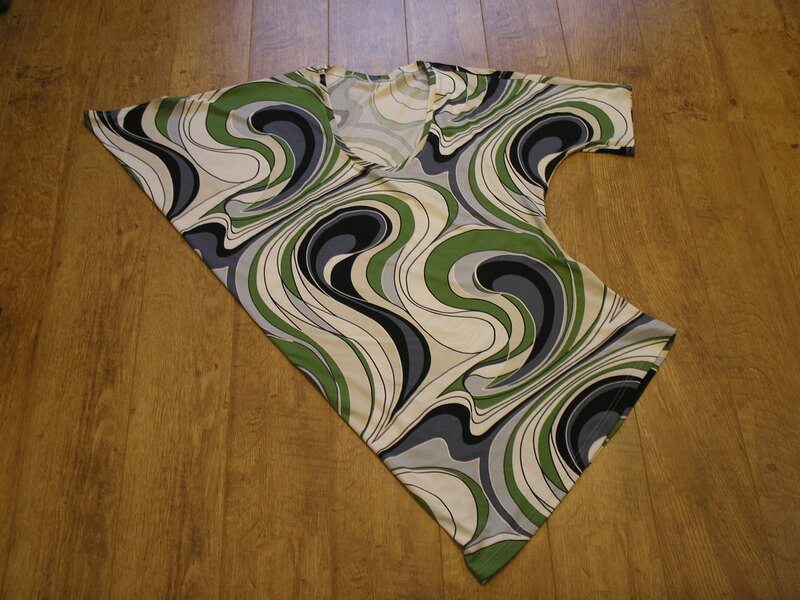 The fabric is a piece of 4 way stretch jersey that I bought at Birmingham Rag Market. Who knows what the composition is – but I would guess at polyester rather than rayon by touch. As you can see it is another of my shy, retiring pieces. The piece was about 150cm square and the piece took almost all of the fabric. 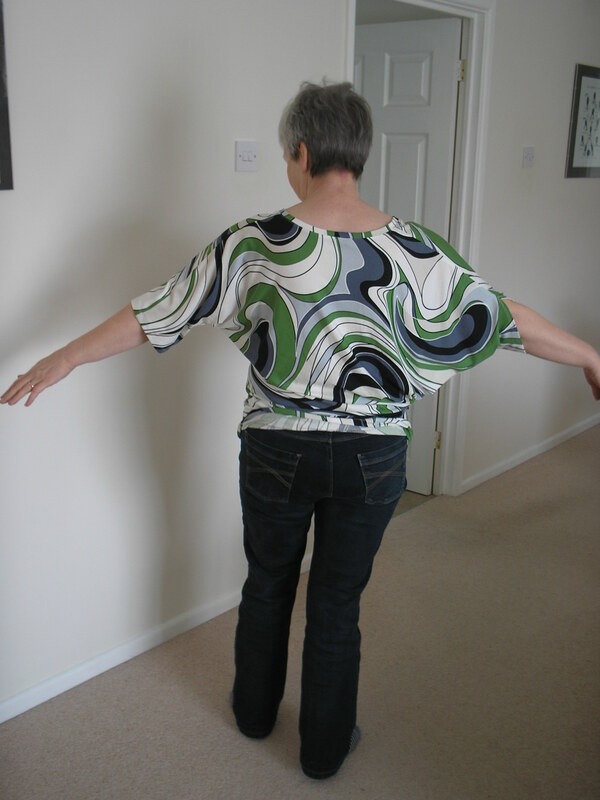 The top from Pattern Magic Stretch Fabrics, the Two Peas in a Pod, needed to be drawn out from the instructions in the book but that was an easy task. As I said in my last post I had graded the blocks up to my size so I knew this was going to fit. I still needed to take it to the copy shop as it is finished by increasing the size of the back piece, and decreasing the front. Again you end up with very strange looking pattern pieces but after the Morley Courses I wasn’t too put off by that. This fabric isn’t so stretchy – only across the grain – and is 100% Polyester jersey. It isn’t what I wanted to use but the other piece I chose wasn’t big enough. This took 130cm as that was how long the larger pattern piece is. The small piece could be cut from the remainder at the side after the back was cut out. I did add a little to the length of the original pieces as I may be a bit taller than the pattern was intended for (despite being only 5’4″). I can always shorten it again if this version is a bit long. I really don’t think these will take too long to sew together once I get the right machines threaded ready to go. I do have other deadlines that I must meet before I start these but I hope to finish them before the end of the week.